DIET: Is Bone Broth the New Super Food? Bone broth contains a variety of valuable nutrients, including calcium, collagen, and bone marrow, in a form your body can easily absorb and use. Homemade bone broth may help reduce joint pain and inflammation, promote strong bones and boost hair and nail growth. There’s something inherently soothing about sipping on a warm cup of broth, and it really does have medicinal potential. 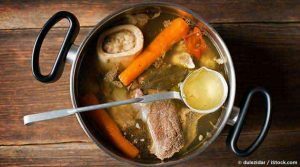 For starters, bone broth is used as the foundation of the GAPs diet, which is based on the Gut and Psychology Syndrome (GAPS) principles developed by Dr. Natasha Campbell-McBride. It forms the foundation because it is so healing to your gut. Additional benefits of bone broth include the following: Reduces joint pain and inflammation, courtesy of chondroitin sulfate, glucosamine, and other compounds extracted from the boiled down cartilage and collagen. Inhibits infection Recent studies on cartilage, which is found abundantly in homemade broth, show it supports the immune system in a variety of ways; it’s a potent normalizer, true biological response modifier, activator of macrophages, activator of Natural Killer (NK) cells, rouser of B lymphocytes, and releaser of Colony Stimulating Factor. Fights inflammation: Amino acids such as glycine, proline, and arginine all have anti-inflammatory effects. Promotes strong, healthy bones, Promotes healthy hair and nail growth. 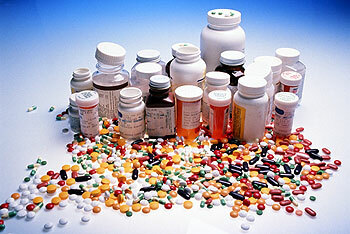 IN THE NEWS: There is a saying in chiropractic that one should always use chiropractic 1st, drugs 2nd and surgery last. Here’s one reason to think about: Man wins $2.5M drug suit after growing 46DD breasts A 20-year-old autistic man won a $2.5 million lawsuit against a subsidiary of Johnson & Johnson Tuesday after his family and doctor say he developed 46DD breasts after taking an antipsychotic drug, the Philadelphia Daily News reports. Austin Pledger, from Thorsby, Ala., was first prescribed Risperdal, manufactured by Janssen Pharmaceuticals, in 2002 when he was 8; at the time, the drug wasn’t FDA-approved for kids, and its label said risk was “low” for gynecomastia (the condition in which men’s breasts grow larger), Thomas Kline, one of Pledger’s attorneys, tells the Daily News. But when the FDA gave the green light in 2006 for the drug to be used as a schizophrenic aid for kids, new labels said the drug contained high levels of the hormone prolactin, which spurs breast growth, Kline adds. Pledger had started growing breasts by then—and now, the only way he can get rid of them is through a mastectomy, Kline says. A Janssen spokeswoman sent a statement to People noting the company is “disappointed” in the decision and that the drug’s side effects were clearly spelled out for Pledger’s family and prescribing physician. FATIGUE Many people suffer from fatigue and unfortunately rely on caffeine or refined carbohydrates to try to manage their fatigue. This is both dangerous and shortsighted. Dangerous because caffeine drinks have significant side effects particularly when they contain high levels of caffeine, which many energy drinks do. Also refined carbohydrates can lead to obesity and diabetes over time. Fatigue has a cause and the cause needs to be discovered and treated in order to resolve the fatigue. There are 3 things patients tell me once they get adjusted, that they feel more relaxed, they sleep better and they have more energy. So nerve pressure with resultant muscle tension can drain the body of energy. Maintaining good alignment can increase the expression of natural energy in your body and help maintain a clear mind in the process. Blood sugar deviations are another cause of fatigue and understanding your body type can lead you to a diet that can help regulate your sugar levels. The quality of sleep is also important as well as the number of hours which can range from 7 to 9 depending on your age. Managing stress is important in maintaining good sleep habits and both chiropractic adjustments and nutritional therapy can go a long ways of helping you manage stress. Of course anemia is another cause for fatigue and blood work can help identify if that’s an issue. Hormonal imbalances can definitely affect someone’s energy level and with Vega testing and nutritional therapy those issues can be resolved naturally. So if you or someone you know suffers from fatigue, tell them about chiropractic, tell them about Keefe Clinic. FUNNY BONE: To succeed in life, you need three things: a wishbone, a backbone and a funny bone. Reba McEntire@@ I have six locks on my door all in a row. When I go out, I lock every other one. I figure no matter how long somebody stands there picking the locks, they are always locking three. @@ First the doctor told me the good news: I was going to have a disease named after me.